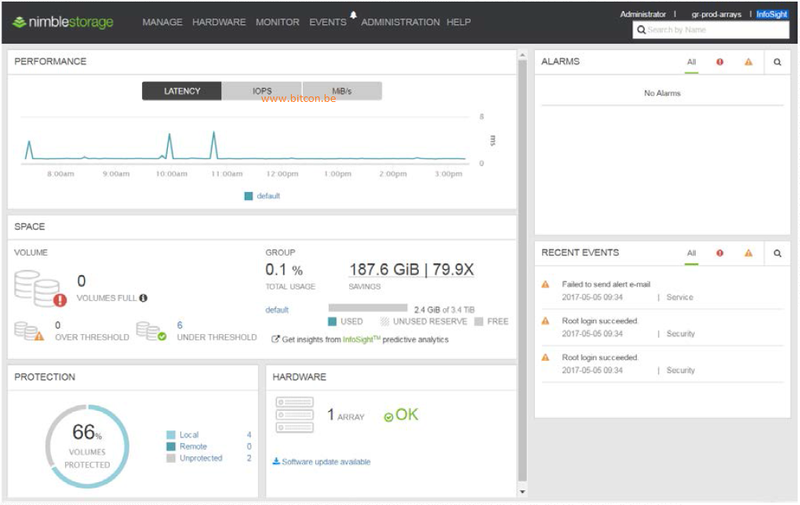 You are here: Home / Blog / Want to Know More About HPE Nimble Storage? Start Here! With the acqusition of Nimble a year and a half ago, HPE adds an important stack of storage arrays into their storage portfolio. What does this mean for the existing solutions MSA, StoreVirtual and 3PAR? Active/Standby controllers: all Nimble arrays have 2 controllers but are unlike HPE 3PAR which are active/active. Nimble guarantees full performance with 1 controller being sure that, if a controller fails, the second controller can handle full workload. NVDIMM’s (like in StoreVirtual): all incoming writes are placed in the NVRAMM of the active controller and is instantly mirrored to the NVRAMM of the passive controller. After the data has been acknowledged it will be moved to DRAM where the magic like deduplication and compression happens, depending of the array type. Triple+ Parity: 3 drives worth of parity information is written. Every chunk in a stripe written to disk consists of data, metadata and parity. This allows a 3-drive failure and allows to recover 1 sector corruption or IO error. First 2 parities are rotational on all disks, 3rd parity is non-rotational and so stays on the same disk. Every AF-series consists of a controller head shelf (4U) and can be expanded with expansion shelves adding more drives to the system. Every shelf can hold 48 SSD’s by using Dual-Flash Carriers (DFC) modules holding 2 SSD drives in 1 3,5” carrier. Since there are 2 independent banks in each carrier it allows to start with 24 SSD’s in a shelf (populating always bank A) and adding more capacity afterwards by filling up bank B. A bad SSD can be replaced as well per bank, not per carrier. In the back, we find the typical items we expect in a storage system: redundant power supplies, fans and controllers with I/O options. 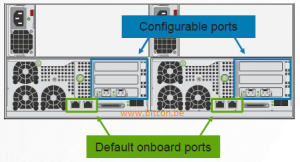 By default, there are 2 onboard 10Gbase-T ports per controller. This can be expanded with 1Gb and 10Gb Ethernet ports and 16Gb FC cards. Mix of port types is supported. The AF-series are a true scale-up/scale-deep/scale-out solution. You can scale up the array just by replacing the controllers with a more performant model: The procedure is rather simple: replace the standby controller, make the standby controller active, and replace the prior-active controller. Scale-out is possible by coupling up to 4 of any Nimble arrays into 1 cluster. You can mix and match array types in a simple configuration, performance is linearly scaled. The hardware is similar to the AF-series. Head shelf with additional expansion shelves, 4U and 24 3,5” slots. However in this hybrid model there are 21 HDD drives and 3 DFC slots for 6 SSD drives. The SSD drives will act as caching tier for the HHD drives. When expansion shelves are added, all these shelves must have SSD’s populated as well. Connectivity options at the back are the same as the AF-series. The same features for scale-up/scale-deep/scale-out remain the same as well. Which makes this array ideal in backup and dev/test environments. Nimble OS is the firmware running on all Nimble arrays. Exact the same version runs on all 3 types of series available today. A feature release is to be expected every 6 to 9 months, we’ll see how this evolves inside HPE. The Nimble UI is rather straightforward with all the information you can expect from a storage array: space, performance, events, hardware status and protection level. Further they have their own MPIO plugin (Nimble Connection Manager) for the most popular OS’s in this world. Further there is tight integration with VMware vCenter (look further). For me the most important feature and must-have from Nimble is the InfoSight stack. All this information is stored in a (really) big Vertica database (today 650TB and growing). 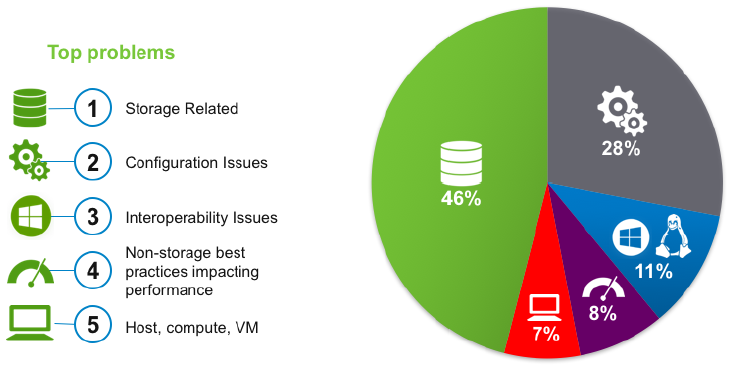 Nimble states that with all Nimble systems installed worldwide they measured >99,9999% availability and could predict and prevent 86% of detected issues being solved and closed automatically. They guarantee as well less than 1 minute to get a Level3 engineer on the phone. Resulting in a high customer satisfaction.